Once again, flawed data and arbitrary control measures drop the hammer on the recreational anglers on the east coast. NMFS has announced that Cobia harvest will be closed in federal waters (3-200 nautical miles) from Georgia’s southern border to New York. According to NOAA the annual catch limits were exceeded in 2015 by nearly one million pounds and then again in 2016 be nearly 700,000 pounds. Let that sink in. The 2015 and 2016 catch limits were set at about 600,000 pounds but they estimate that 1.5 million and 1.3 million pounds were harvested respectively. Now they say that the reason for the increased harvest rate is an increase in recreational trips by a rate of 25% from 2014-15 and another 18% from 2015-16. Refer to the table below and the data pulled straight from the closure notice. Now I want anyone who has harvested cobia in the last several years to think back to any time that their catch was recorded. I’ll give you a minute to think about it… Well as an angler and guide, I have never had a cobia harvest recorded from one of my fishing trips here in Georgia. You’ll see that evidenced in the table below from the 2016 closure notice where it shows that there were no harvests recorded in Georgia. So now you can see that this data was collected from 2013 to 2015 and supposedly represents “average recreational landings”. The point I’m getting to is that 1) the data collection is flawed as evidenced above by the fact that Georgia wasn’t even represented and 2) the sample size is too small and is subject to too many variables that can cause fluctuation in numbers. So by taking a few surveys and doing some angler hating mathematical wizardry, they are coming up with some wild numbers. Who are they surveying? For hire vessels, that’s who. That’s like judging your golf handicap based on a PGA golfers score cards. These guys are out there every day and it’s their job to whack the fish, and they’re pretty good at it. Does their data account for how many days during peak Cobia season we lost due to weather? More specifically, how many WEEKENDS were lost due to weather? Most people work for a living and we all know that it’s always calm Monday through Thursday but when the weekend rolls around it’s wind and clouds. There is no way that the current data collection system can even come close to accurate estimates of Cobia harvest. due to the underwhelming data and lack of evidence that is presented from a department that has admitted to the use of flawed data. 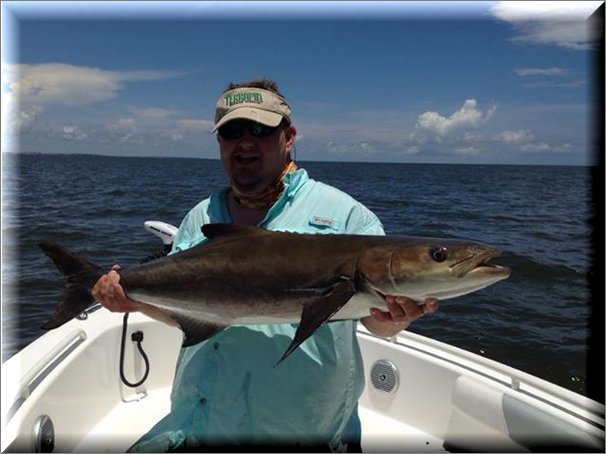 While we recognize that Cobia are migratory and are shared by several states, we also recognize that the habits and accessibility of Cobia varies from state to state. The way that Cobia are targeted in the Broad River is much different than way that they are targeted on the reefs of Georgia or the beaches of North Carolina. We trust the States to ensure that Cobia are harvested responsibly in federal waters just as they do in state waters.